38" x 38"- What do you get when you elongate a Cobblestone block? My Zip Zap Brick block. Zip Zap Bricks are assembled like "Courthouse Steps" with only one round, but visually it looks like a tissue box. Some of you will go beyond the wall hanging straight to the full size quilt. If that is your intent, go to it. 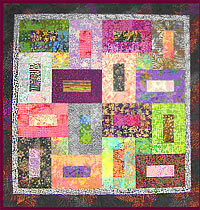 A full size quilt can be pieced in a weekend. So, get out all those 2 1/2" strips that you've been saving and get sewing. Note: This pattern is included in Bricks, Cobblestones and Pebbles book.